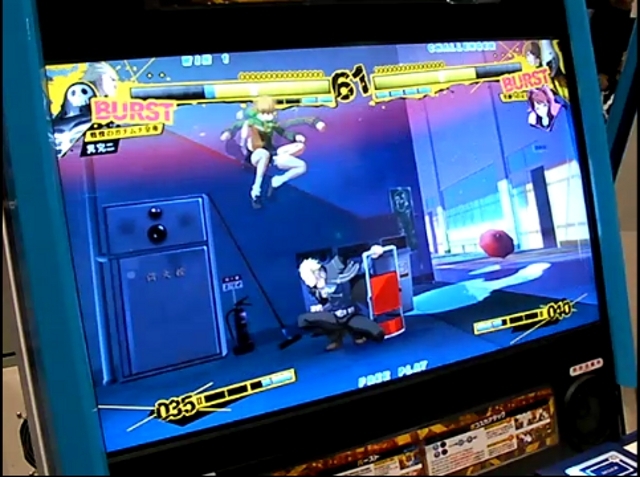 Spotted at NicoNico Douga, we now have the first real gameplay footage of the new Persona 4 fighting game. As expected, the action is fast paced, and somewhat BlazBlue like (given this is being made by Arc System Works). And to answer fears of gamers thinking all the characters play like Carl Clover in BlazBlue: No, they do not play like him. Instead they simply come out to perform special attacks and super attacks. For those wondering how the button layout and configuration will be for this fighting game, it’s hard to tell. But from the little bit we can see on the lable below the screen, it seems to use a 4-button layout. The super meter seems split into three parts and counts from 0 to 200, so maybe some supers probably consume different amounts of bar. Big thanks to Lewis, aka l-slick, for the tip! This entry was posted in Gaming News and tagged P4, P4u, persona, Persona 4, persona 4 fighting game, Persona 4 the ultimate in mayonaka arena on September 15, 2011 by Steven T..